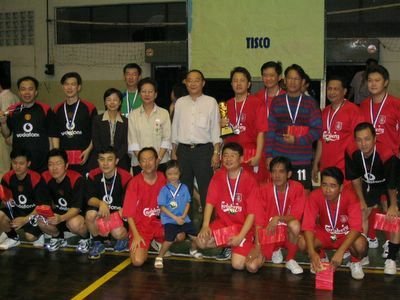 Khun Suthas Ruangmanamongkol (MD of TISCO ASSET), Chairman of TISCO FUTSAL Competition 2005, poses with the athletes and supporters at Lumpini Park. 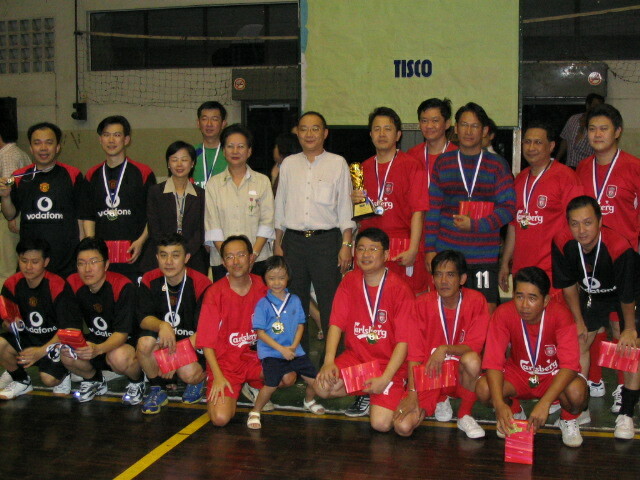 The Futsal Competition is one of the activities that the TISCO Group supports as a Fund Raising event for the TISCO Foundation. Standing from the left : Apichart Gowsujjaritkul HR&OD, Rungroj Jarusvijitkul HP (New car), Suthipirom Areesakulsuk HR&OD, Somchart Lapapong Brokerage Private sales, Suthas Ruangmanamongkol MN/TASSET/TISCO Group, Wiwat Tachapoonpol Brokerage Private sales, Ekachai Jongvisal Mutual Fund, Songsak Niltien RFC&S, Sontaya Thanomkiat Follow-up HI-WAY, Dejphinun Suthaadsanasoung CL. Kneeling from the left : Somsak Wongwachirawanich HP (Used car), Akaranant Thitasirivit Provincial Loan, Jeeravat Jongjinvisut IT, Kittichai Tonnajarn Banking OP, Santipatana Sriphuvieng HR&OD, Sompob Jarusamit Corporate Service, Thoranis Komutvong Marketing HI-WAY, Suthep Trivannakij HP (New car). Who is the kid in blue shirt?